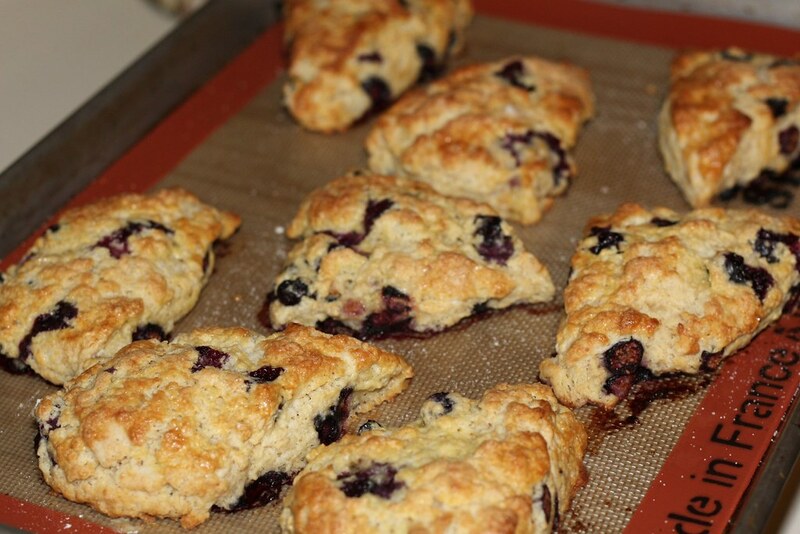 A good fruit scone is possibly my favorite go-to breakfast treat. In my old age, I often dont want an excessively sweet breakfast (though I do still sometimes succumb), but I do still want something bursting with flavor that pairs well with my morning coffee. I had some blueberries sitting around in the fridge, and I happened to come across this recipe in an old issue of Martha Stewart Living, when I was searching for a chicken fajitas recipe that I enjoy. I think fate was trying to help me use up the blueberries, since I still havent made the fajitas! The scones have been made, and still many reside in my freezer, just waiting for the mornings when I need a little bit of a treat. They do freeze well to reheat, simply pop one in a 350*F oven for 10 minutes. For an extra touch of sweetness, dust with confectioners sugar. Preheat oven to 375*f. Line a baking sheet with a silpat or parchment. Add flours, sugar, baking powder, and salt to the bowl of a food processor fitted with the S blade. Add butter and pulse a few times until the butter is the size of peas. Remove flour to large bowl, add blueberries and mix. Whisk together ½ cup buttermilk, one egg, and the vanilla. Pour buttermilk over flour and stir with a fork until the dough just comes together. If the dough is too dry, add a little more buttermilk as needed. Remove dough to a floured surface and pat into a one inch thick round. Cut into eight wedges and transfer to baking sheet. Brush with egg wash and sprinkle with sugar, if desired. Bake until golden brown and cooked through, 20-25 minutes.